Epson SureColor T5460 - 36"
The Epson SureColor Technical series is a versatile and compact range of printers. They are designed for users who need to produce large-format colour and black-and-white images, economically and at high speed. They are compatible with a wide range of media from basic bond paper, to photographic media. They support high resolution print with dense and consistent colour. They are ideal for maps, plans, drawings, schematics, geological survey diagrams, sales presentations, POS, posters and displays. The SC-T5460 features Epson's latest PrecisionCore™ print head and aqueous UltraChrome® XD2 pigment ink. It will print an A1 image in as little as 22s with output that dries almost instantly to be water and rub resistant. Ink ships in a range of cartridge sizes to suit different production and cost-per-print requirements. Designed for businesses that want to produce wide format prints, the printer is supplied with a stand and paper basket and can be installed against a wall or in a corner. 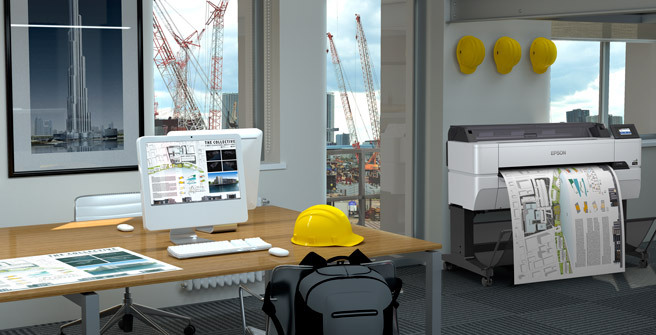 It also ships with software that enables easy printing from office and CAD/GIS applications. 1 When printers are installed, maintained and operated appropriately using correct and genuine Epson UltraChrome XD ink they are covered by a comprehensive on-site warranty subject to conditions outlined in the Epson Australia Warranty Statement. Service Cover can be extended through the purchase of optional CoverPlus up to a maximum total of 5 years subject to conditions documented in the relevant service pack. Figures represent print times only for Epson test sample images as shown produced on plain paper in speed mode. Additional processing time may be required with individual results likely to vary depending on print mode, software, operating environment, media, data file size/type. Manual Double Sided Printing Please refer to user guide, and contact Epson or your authorised dealer before selecting any media for this purpose in order to check suitability. What’s in the Box Printer, Power Cord, set of 110ml ink cartridges, 1 x Maintenance Tank, Setup Guide & Warranty Info. Driver, user software & manuals on CD. Delivery & Install Some assembly and configuration may be required. A significant proportion of the included ink will be required to ‘prime’ the printer and it is recommended that an additional set be purchased for production work. Delivery, de-boxing and package removal is not typically included but can be provided at an additional charge for most locations. 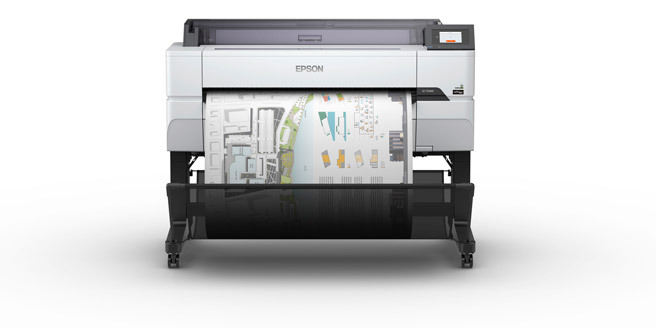 Service & Support Support and Service is provided via authorised Epson authorised Large Format Technical Dealers. If you have a problem with a SureColor Technical printer, a related option or consumable please contact your dealer for initial problem evaluation. Should a printer require service this will be provided by on-site free of charge within the period covered by your Warranty and any optional Service Pack. Note: Provision of service and support is subject to Large Format Printer Warranty terms and travelling charges may apply for equipment located outside major metro areas. ** Epson CoverPlus Service Packs enable cover to be extended. One or more Service Packs can be ordered in conjunction with the various printer configurations &/or options to enable cover for 1, 2, 3, 4 and 5 year periods (total cover cannot exceed 5 years). Service and support is only provided for product supplied through Epson Australia or Epson New Zealand. This facility is provided in conjunction with the Authorised Large Format Reseller through which the product is ordered. Limitations apply to the provision of Warranty and CoverPlus. Regional locations and certain installation situations may attract additional charges. Service may be restricted or limited when equipment is used outside of specification, with non-genuine Epson consumables, and consumables not designed for use with the particular printer model. For full details on coverage, terms and limitations please review the warranty terms listed on this web-site and contact Epson or one of our Authorised Large Format Resellers if you have questions or concerns.